What do Kiss and Keyshawn have in common? What do Keyshawn Johnson and rock legend Kiss have in common? Well, considering Gene Simmons won’t be running a 4.4 40 any time soon, I’m going to have to answer “Wine”. It’s not new for celebrities to “come out with” wines, cashing in on their goodwill. However, what’s behind the wine, and is it worth pouring? I’ll start out by saying I have not gotten samples of either celeb bottle of wine, nor have I tried either. I don’t propose this to be a review of either, but rather a question about transparency and marketing. There’s no doubt that Gene Simmons is a marketing genius. His show Family Jewels often portrayed him as a media mogul who was able to parlay a decent sounding band with a cool concept in the 70s to a top grossing band. A band that is still making money from those dolls and cards and everything else that he could stick a long tongue on. However, does that make for a good glass of wine? In most, if not all cases, celebrities aren’t actually buying wineries and managing grapevines and alcohol levels. They’re selling their names, earning royalties on each bottle sold, and being the face of the wine. 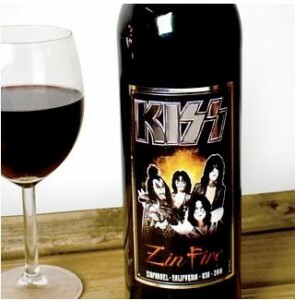 I actually remember the show where Gene Simmons went to a winery interested in him representing the wine. It made for an awkward moment because Gene doesn’t drink alcohol. For him, it was all about the numbers. If it would be profitable enough, he’d do it. He’s a business man. Keyshawn Johnson is the same. For Keyshawn, there’s no doubt he hooked up with a half decent winery to put his name behind, or in front of. Master Sommelier, and Palm Beach county resident Virgina Philips gave the wine a pretty favorable review. While she didn’t rate it, her comment of ” The wine tastes well on its own; pairing suggestions include” leads the reader to believe that someone who knows more than a bit about wine is recommending it. And at $125 a pop, you’d want it to taste at least ok. Johnson paired with R.C. Mills, a Los Angeles wine business expert who’s been in the wine biz since 1996, and was a chef and caterer. However, neither KJ1 or Kiss wine tell you who is behind the wine. It was impossible for me to find out who’s grapes and who the vintner was for either wine. What I want to know from you is how prone are you to buying wine based on the label, or marketing? Are you more inclined to buy Mommy’s Time Out for it’s kitchy cute name, or KJ because Keyshawn is hawking it on NFL Countdown each week? Or are you more prone to finding good quality wines, where you know who the winery is behind the label? Does it matter that Gene says “If you like wine, this is the one for you?” Or is that a hard sell from a guy who doesn’t drink wine? Sound off below! After having a long conversation with the Kendall Jackson Winery & Enterprises, we have decided to honor their request and change the name of our wine from KJ1 by Keyshawn Johonson to XIX (nineteen) by Keyshawn Johnson. A smart move, respecting Kendall Jackson and founder Jess Jackson’s memory. Another late edit – It seems that the wine for XIX comes from Echo West. Sadly, Google doesn’t seem to recognize “source of grapes for Keyshawn Johnson’s wine”, or about 30 variants. So, even though we know that harvested in October 2007 of 100% Cabernet Sauvignon grapes, all produced on Echo West’s 25 acres of Cabernet stock overlooking Oregon’s Umatilla River. I still want to know your thoughts on Celebs marketing wine! Sound off!